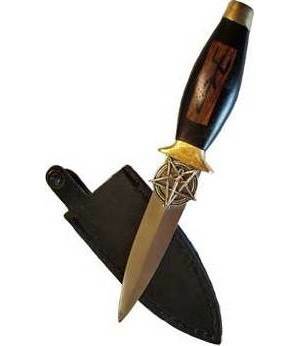 This two sided athame has many features: pentagram with sword amultet applied to blade, as well as a bind rune on one side hilt with light wood background all in clear coat finish - the other side, hilt is dark. This tool can be used by many traditions for many purposes. Has leather sheath: 7 1/4" - with 4" blade.